Industrial strength meets industrial speed. The ContiRV20 Velocity has been developed by Continental for industrial high-speed and long-distance applications, such as airport ground service. Excellent fuel economy, optimum battery life in electric vehicles, and reduced CO2 emissions. 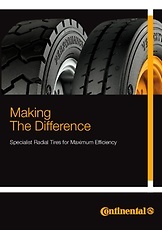 Thanks to its special compound and reduced tread depth, our ContiRV20 Velocity offers maximum all-round performance like no other tyre: Industrial Strength, Industrial Speed, and Industrial Comfort. This makes it ideal for applications in airports (ground handling) and the automotive industry. The ContiRV20 Velocity is also highly popular in the warehousing and logistics industry as well as for in-plant transportation and road cleaners. 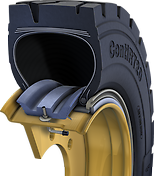 Furthermore Continental offers the ContiRV20 Industrial for tougher applications. With its circumferential ribs, this tyre ensures outstanding levels of comfort and smooth running as well as uniform wear. It also features a ribbed tread design for minimising vibrations and a radial carcass for maximising comfort. Moreover, the ContiRV20 is made from a special cut and chunk-resistant rubber compound, making it ideal for heavy-duty forklifts used in harsh environments. All ContiRV20 dimensions can be mounted without tubes . Designed and developed for terminal tractors. Designed and developed for terminal trailers. The Standard in Power and Durability.